Elaion is proud to announce that the first ever Pandora's Kharis donation run has raised $174,- for our democratically decided upon cause Doctors Without Borders. This is an astounding amount for a giving circle that came together only a few short weeks ago, and it shows the generous spirit of the Hellenistic community. PayPal takes its standard fees from the transactions--in this case about $10,-, which was covered by Elaion, making sure every cent of your donation went to Doctors Without Borders. The average amount paid by the contributors was around $7,-, with donations coming in as high as $25,-. 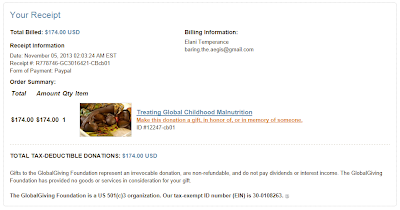 As Doctors Without Borders only allows PayPal donations on specific projects, we have decided to contribute to Doctors Without Borders' 'Treating Global Childhood Malnutrition'-campaign, which they host on Global Giving. Doctors Without Borders teams treat more than 300,000 children annually at more than 100 nutrition programs, mostly in Africa and Asia focusing on the most vulnerable populations, children under age three with severe acute malnutrition. Until 2005, MSF hospitalized these children in inpatient therapeutic feeding centers. Now, thanks to the advent of therapeutic ready-to-use food (RUF), MSF can treat the majority of malnourished children as outpatients and dramatically increases the number of patients treated. Our donation is enough to purchase 765 emergency food rations, seven months of lifesaving therapeutic food to treat a severely malnourished child, or purchase several infant scales to weigh children too young or too weak to stand on their own. In days to come, the organization will receive a letter from Elaion, detailing our donation and our cause. We also encourage members who have given so generously to dedicate this gift to the Gods, especially the Kourotrophos; (mostly) female deities who watched over growing children--Gaea, Artemis, Hekate, Eirênê, Aglauros and Pandrosos, especially. A pre-made ritual can be found here, on the Elaion Facebook page.